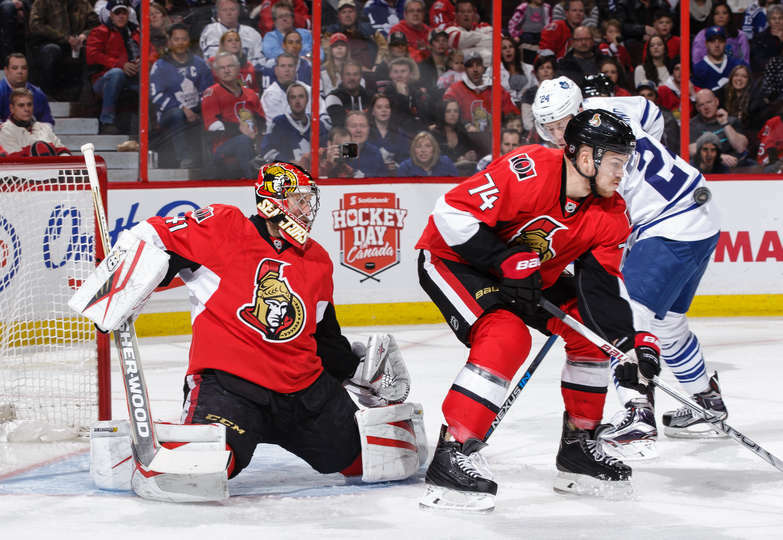 OTTAWA – The Ottawa Senators bucked a couple of trends when they ended a three-game losing streak in a 6-1 win against the Toronto Maple Leafs at Canadian Tire Centre on Saturday. Sparked by captain Erik Karlsson’s four assists, the Senators (24-23-6) took an early lead and enjoyed some strong penalty killing in the victory. It was the 18th time in 53 games in which they scored first; their penalty killing, ranked 30th in the NHL going into the game, was 4-for-4. Curtis Lazar had two goals and Zack Smith, Mika Zibanejad, Bobby Ryan and Mark Stone scored for the Senators. Craig Anderson made 26 saves. Pierre-Alexandre Parenteau scored for the Maple Leafs (19-23-9). James Reimer made five saves on eight shots before he was pulled at 7:38 of the first period. Jonathan Bernier made 14 saves. The Senators took advantage of two odd-man rushes to help build a rare 3-0 lead in the first period. Karlsson became the first defenseman to have multiple four-assist games in a season since Chris Chelios in 1994-95, according to Elias Sports Bureau. Karlsson also had four assists against the Columbus Blue Jackets on Oct. 14, 2015. The Senators, who had lost five of their previous six games, had a series of meetings beginning with a players-only meeting after their 7-2 loss to the Edmonton Oilers on Thursday. Anderson said the Senators went into the game against the Maple Leafs with a better attitude. Smith finished a 2-on-1 with defenseman Marc Methot 19 seconds into the game after the Maple Leafs got caught pressing in the Ottawa zone. Methot broke down the left wing and fed Smith, who has been among the Senators best forwards the past few games, for his 10th goal of the season. Maple Leafs captain Dion Phaneuf took the blame for that one. “The first one, it’s a bad read on my part. The puck’s rolling. If it goes the other way …,” Phaneuf said. “I make a bad read and that’s a tough way to start. That’s on me the way that we started. It continued to snowball. They continued to come. We’re behind coming out of the first in a real big hole. We just didn’t find a way to claw back into the game. At 4:21, Jean-Gabriel Pageau came out of the penalty box to create another 2-on-1 with Zibanejad. Pageau skated down the right side and set up Zibanejad for a one-timer that went past Reimer on the stick side. Reimer was replaced by Bernier after Ryan’s shot from the right wing, which might have been deflected by a Maple Leafs defender, hit his right arm and fell into the net at 7:38. The Senators killed off three Toronto power plays in the first period. The third penalty came when Stone was called for tripping Toronto forward Joffrey Lupul, whose skate came up and caught Stone in the face. Stone went to the Senators dressing room, but returned shortly afterwards. Zibanejad was penalized for an illegal check to the head on Toronto forward Tyler Bozak, who left the game and did not return. Lazar scored the only goal in the second period. Shortly after Bernier made a nice glove save against him, Lazar was handed a rebound in the slot off a shot by Karlsson. Lazar scored at 7:08. It was his first multi-goal game of his career. Anderson made a few good saves in the second period, including a glove stop on Phaneuf during a 4-on-3 Maple Leafs power play. Stone and Lazar scored early in the third period before Parenteau scored the Maple Leafs first goal at 3:25 when he put in a backhand into the open side to Anderson’s left off a pass by Daniel Winnik.